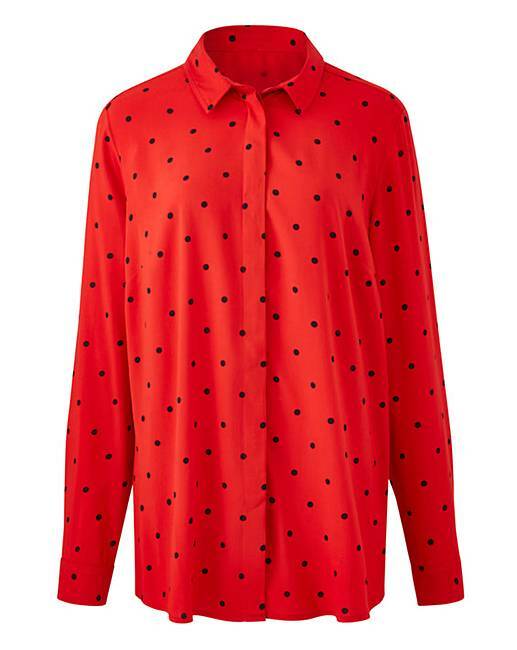 Red Spot Printed Viscose Shirt is rated 4.2 out of 5 by 16. Update your wardrobe this season in this viscose printed shirt, which is fashioned from a supersoft viscose fabric. The shirt also features a concealed button to the bust area. The shirt is available in various prints. Simply pair with jeans and flats for the perfect daytime look. Rated 4 out of 5 by Peachy84 from Decent fit and lovely colour. The shirt is great for the money. It fits really well even on the arms. The additional buttons on the chest area are a great addition to stop the gapping that can happen with having a big chest. It's a little shorter then I'd of hoped for (something Simply Be are often guilty of) Fabric is lovely and soft which is comfortable to wear. It does mean it creases up easily. I'd sized up a few sizes for a more roomy fit and had hoped it would of helped with the length. Rated 5 out of 5 by Emmad77 from Great fit Fits perfectly. Has added double buttons to make sure doesn’t gape round the bust. Lovely colouring too. Great for work or with my jeggings when socialising. I was worried it may be a little short in the body (I’m 5ft9) but fitted perfectly covering the stomach and bottom! Rated 5 out of 5 by leetalee from Lovely Very pleased with this. Comfortable and stylish. My granddaughter (14 years old) liked it. Rated 5 out of 5 by Tangelina87 from Perfect fit! Recieved this item today. Normally, when buying shirts, I have to buy one or two sizes bigger to ensure it buttons up over my chest. I forgot with this purchase, and just ordered my regular size - and it actually fitted! I'm so pleased!!! The shirt itself is really soft and comfortable. The shirt is a little shorter than I was hoping, but I was planning on wearing it either tucked in or tied at the front anyway, and I am tall so this is often an issue with tops. Rated 5 out of 5 by Sooty from Striking top This blouse is a lovely fabric it drapes well easy to wash and wear. Great addition to my daily wardrobe.